The American Fuzzy Lop rabbit is a snuggly little bunny that reminds us of a teddy bear! The American Fuzzy Lops generally have wonderful personalities and like many of the lop rabbits, they love to be cuddled! They have wonderful personalities and are also great for showing. They are furry and cute and can be very loving and affectionate. This bunny is considered a good first rabbit for new owners. Both males and females are very sweet and make excellent pets though females can sometimes be a bit more shy and skittish. Females can especially be nervous with loud noises and fast movements. True to their name they do have long fuzzy coats. They will need some regular grooming, generally once a week for an adult. Babies will need grooming more often until they get their adult coats at about six months. 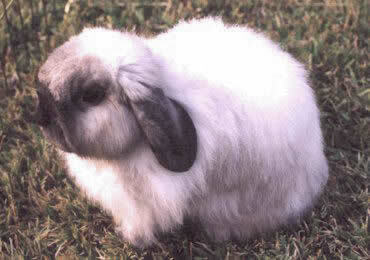 Background: The American Fuzzy Lop originated from the Holland Lop. There are a couple of suggestions as to how this bred developed. One idea is that this a genetic fault in the Holland Lop where occasionally a long haired Holland Lop results. Another idea is that an occasional long haired Holland Lop is a result of much earlier breeding attempts between the Holland Lop and the Angora, so some Holland Lops could be carrying the the necessary gene to produce long hair. Either way, long haired Holland Lops were bred together to create the American Fuzzy Lop which became a recognized breed in 1988. Description: The American Fuzzy Lop Rabbit is a small, round, wooly rabbit weighing up to about three and a half to four pounds. They have short wide faces, short lopped ears, and long fur. Color differences: The American Fuzzy Lop Rabbits come in a variety of colors and patterns. Several groups of colors include: agouti, broken, pointed white, self, shaded and solid. There are 19 recognized show colors. They don't say how to feed them. I am trying to find a pet American Fuzzy Lop in Wisconsin. I am also wondering if you can breed a Jersey Woolly to a Dutch and get a fuzzy Dutch. I also have my heart set on a 6 wk old bunny since that is what I have raised all of my life.